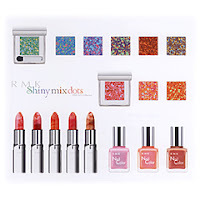 Promo visual for RMK's Spring '08 "Shiny Mix Dots"collection. Release date is 1 February in Japan. 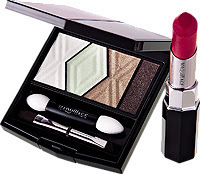 Inspired by the purity, energy and innocence of spring, Shu Uemura's spring '08 collection, "Rebirth" features a palette of soft and vivid hues embellished with a unique and graceful leaf motif to communicate the revitalization of nature occurring at this time of year. The collection will be launched in Japan on 18 January. 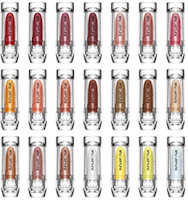 Shu Uemura will also be launching a new line of Rouge Unlimited Crystal Shine lipsticks in 18 shades. The Paul & Joe website has also been updated with the Spring '08 collection, Sweetie. The English website does not feature the Disney collection that is being released in Japan on 1 February (reservations start on 25 Jan) which means the Disney collection is most likely Japan or Asia-exclusive. The English website also features two eyeshadow trios and a Protective Hand Cream, which are not on the Japanese website. Kiss will be launching a small limited edition collection on 18 January comprising an eyeshadow quad, Dessert Chocolat Eyes (1680yen), and two chocolate-scented lipglosses, Rouge Melty Chocolat #1 Strawberry and #2 Mocha Chocolat (1470yen each). Check out the collection here. 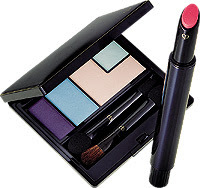 Jill Stuart's spring collection, "Seductive Eyes", is up on the official website. The model is wearing Seductive Eyes #1 Seductive Doll, Eyeliner Pencil #1 Charcoal Black, Extra Curl Mascara Waterproof #1 Pure Black, Mix Compact Blush #6 Fresh Apricot, Lip Lustre #19 Pure Cherry, Lip Gloss #18 Pink and Nail Lacquer #44 Aurora Shine. The application instructions for Seductive Eyes is different from Brilliant Eyes. For Seductive Eyes, the second shade from the left is the base shade that should be applied first while the first shade from the left can be used last by patting it on top for added glimmer and sparkle. 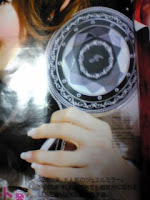 Jill Stuart will be releasing a new mirror in February. Pics from 2Channel. It's that time of the year again for Isetan's (Singapore) famous private sale! 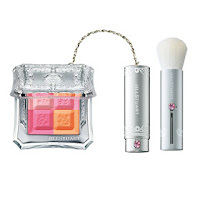 Isetan cardholders will also get to enjoy the 10% Beauty Bonus Vouchers. 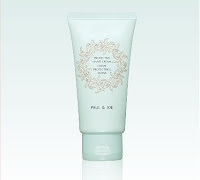 There are also GWPs galore with several brands. For example, Paul & Joe is giving away this Muse bag with matching phone pouch with purchases of $150. So what are you waiting for? Get yourself to Isetan on 27 December! For non-cardholders, not to worry as the sale will run from 28 December to 10 January. One of the best perks of being a beauty editor for a magazine like Biteki must be being able to play with all the new makeup collections before they are launched at the counters. Just check out the picture at left from Biteki's photo shoot for its current issue! The Feb '08 issue of Voce features pop star Ayumi Hamasaki on the cover with her usual combo of pale glossy lips paired with dramatic false lashes and perfectly lined eyes. It's a look that works well for her, given her big doe-like eyes but I wish she would experiment with more colours sometimes. 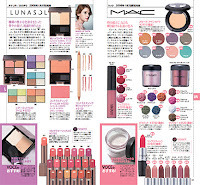 There are the usual makeup tutorials featuring the new spring makeup collections and hair styling tips. There is also a detailed survey comparing the shampoos and conditioners by major labels such as Tsubaki, Asience, Sala, Ichikami, Mod's Hair, Lux and L'Oreal. If you're trying to decide between Voce, Maquia and Biteki this month, I would recommend going for Voce. Maquia does come with awesome freebies though: two Bihada Ichizoku masks and a huge sachet of Bathology bath liquid. Maquia will be featuring the Spring '08 collections only in its March issue next month. I didn't get a chance to flip through Biteki. Plus there was only one copy of Biteki left by the time I got to Kinokuniya yesterday evening so it's probably sold out already. 1. 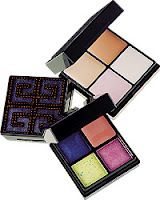 Chanel La Quatre Fleur de Chanel: Four pastel eyeshadows with a camellia motif in white, lilac, pink and silvery grey. 2. 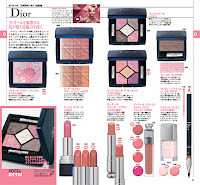 Dior: Skin Shimmer Powder #001 (Pink) looks like the most gorgeous array of shimmery pinks ever! 3. 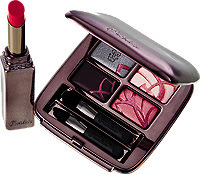 Dior: Cinq Couleurs Iridescent #909 - another winning array of soft peach, pinks, purples and golden beige. 4. Armani: Fluid Blush #18 a pinky peach. I simply adored the two Fluid Blushes from the Berry collection earlier this year so it's great to see Armani putting out a new shade. Pity that these are so expensive at 5250yen each. Coffret D'Or will be launching its base makeup range on 1 March. The new foundations contain a "Pure Proof Powder" that reportedly helps to provide good coverage of skin flaws with a natural, translucent finish. Prismal Blush looks like yet another knock-off of YSL's Touche Blush while the loose powder packaging is very similar to Revue. Coffret D'Or will be replacing Revue, which has been my staple brand for powder foundations for the past couple of years. Although the quality level is unlikely to change much, the classic gold packaging of Coffret D'Or doesn't appeal to me as much as Revue which had a more youthful, fresh pink theme. Coffret D'Or looks like it's for more mature ladies rather than the models in their early 20s featured in the advertising campaign. That's just my pet peeve about these so-called 'mega beauty brands' like Maquillage and Coffret D'or. They just lack a sense of playful fun and innovation that is, for me, what the appeal of makeup is all about. Jill Stuart: The good news is that all items are permanent except for the three nail polishes. Visee: In addition to two new Jewel Crush Eyes palettes, Visee will be introducing Metallic Loose Powder (1890yen) in 5 shades, 3 new shades of Metallic Gloss Rouge lipgloss, a new volumising fibre-based mascara called Lash Glamour Shape (2100yen) in 2 shades plus 5 new shades of Glamorous Nail polish. The collection will be launched on 16 January. Integrate: Integrate is introducing a new water-based liquid eyeshadow, Primalise Eyes (1680yen), 3 new shades of its ever-popular Glamorous Rouge (1260yen) and 3 new shades of nail polish. Release date is 21 February. 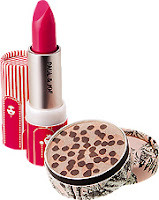 Integrate Gracy: New Liquid Rouge lipgloss (997yen) in 10 shades and 10 new shades of nail polish (367yen). Giorgio Armani: 5 new shades of Maestro Eyeshadow (3990yen), a peach-toned Fluid Blush #18 (5250yen, limited edition), Armani Silk Lipstick #67 (3885yen, LE), Lip Shimmer #49 (3675yen) and Fluid Shine Nail Polish #33 (3150yen). Due out on 2 January. 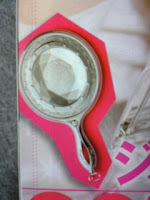 Kate: Check out the the new Powder Gel Liners in GD1, SV1 and BK3! GD1 and SV1 look very brightly metallic while BK3 is supposed to have multi-coloured shimmer. Next to the gel liners are swatches of the new Square Cut Eyeliners. Lavshuca: I'm still not feeling any love for these Noble On Colour Eyes (1575yen). 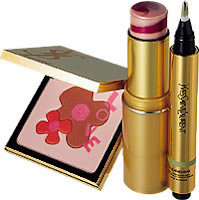 RMK: Impressionism-inspired Shiney Mix Eyes (3360yen) and Shiney Mix Cheeks (3150yen). Release date is 1 February and the items are limited edition, available until August 2008. Majolica Majorca: Looks like another collection that I can safely skip. Maquillage: Perhaps inspired by the success of Kate's Powder Gel Liner, Maquillage is introducing Dramatical Gel Liner in 5 shades which will retail for 2625yen, which is more than double the price of Kate's version. Ipsa: Yet another candy colored pastel collection from Ipsa, due out on 11 January.